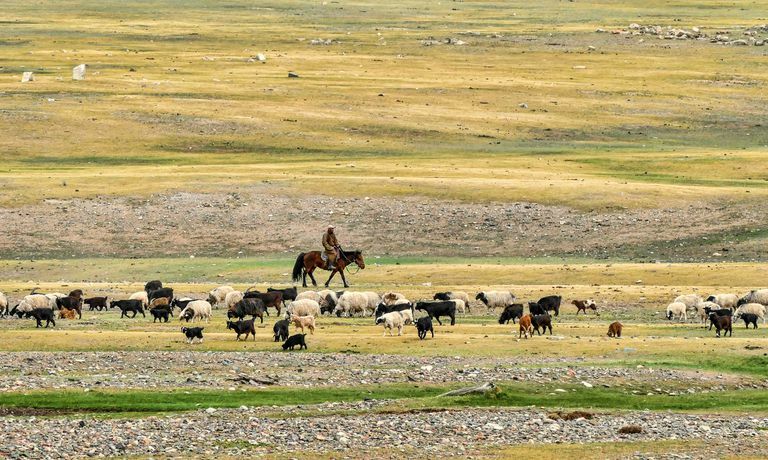 Ecologically, the steppe can be characterized as part prairie, part desert, and part semi-desert, and it extends in Asia from Hungary to the Altai (or Altay) Mountains and the forests in Manchuria. In the northern parts of the steppe range, rich grasslands covered in snow for about a third of the year provide some of the best pasturelands on earth: but in the south are dangerous arid deserts dotted with oases. All of these areas are part of the mobile pastoralists homelands. Ancient historical texts from the settled parts of Europe and Asia describe their interactions with steppe people. Most of that admittedly propagandist literature characterizes the Eurasian nomads as fierce, warlike barbarians or noble savages on horseback: for example, the Persians described their battles between the nomads as the war between good and evil. But archaeological studies of the cities and sites of the steppe societies have revealed a far more nuanced definition of the nomad life: and what is revealed is a wide diversity of cultures, languages, and methods of life. The people of the steppes were the builders and maintainers of the vast Silk Road, not to mention the traders who moved countless caravans across the pastoralist and desert landscapes. They domesticated the horse, invented war chariots and also probably the first bowed instruments. But--where did they come from? Traditionally, steppe societies are believed to have been arisen from agricultural societies around the Black Sea, becoming increasingly reliant on domestic cattle, sheep, and horses, and then expanding eastward in response to environmental change and the need for increased pastureages. By the Late Bronze Age (ca 1900-1300 BC), so the story goes, the entire steppe was populated by mobile pastoralists, called by archaeologists Andronovo culture. According to research by Spengler et al. (2014), the mobile Steppe Society herders at Tasbas and Begash were also directly involved in the transmission of information concerning domestic plants and animals from their points of origin into Inner Asia during the early third millennium BC. Evidence for the use of domesticated barley, wheat, and broomcorn millet has been found at these sites, in ritual contexts; Spengler and colleagues argue that these nomadic herders were one of the ways in which these crops moved outside of their domestications: broomcorn from the east; and wheat and barley from the west. First: a reminder: language and linguistic history do not match one-to-one with specific cultural groups. Not all English speakers are English, nor Spanish speakers Spanish: that was true as much in the past as the present. However, there are two linguistic histories that have been used to try to understand the possible origins of the steppe societies: Indo-European and Altaic. According to linguistic research, at its beginnings ca 4500-4000 BC, the Indo-European language was largely confined to the Black Sea region. About 3000 BC, Indo-European language forms spread outside of the Black Sea region into central, southern and western Asia and the northern Mediterranean. Part of that movement must be tied to the migration of people; part of that would have been transmitted by contact and trade. Indo-European is the root language for the Indic speakers of South Asia (Hindi, Urdu, Punjabi), the Iranian languages (Persian, Pashtun, Tajik), and the majority of European languages (English, German, French, Spanish, Portuguese). Altaic was originally located in Southern Siberia, eastern Mongolia, and Manchuria. Its descendants include Turkic languages (Turkish, Uzbeck, Kazakh, Uighur), and Mongolian languages, and possibly (although there is some debate) Korean and Japanese. Both of these linguistic pathways seem to have traced the movement of nomads throughout and across central Asia and back again. However, a recent article by Michael Frachetti argues that this interpretation is too simplistic to match the archaeological evidence of the spread of people and domestication practices. Frachetti's argument lies in his assertion that the domestication of the horse cannot have driven the rise of a single steppe society. Instead, he suggests scholars should look at three separate areas where mobile pastoralism arose, in the western, central and eastern regions of central Asia, and that by the fourth and early third millennia BC, these societies were specialized. The sparsity of the archaeological record continues to be an issue: there simply hasn't been a great deal of work focused on the steppes. It is a very large place, and much more work needs to be accomplished. This glossary entry is a part of the About.com guide to Human History, and the Dictionary of Archaeology. See page two for a list of resources. This glossary entry is a part of the About.com guide to Human History, and the Dictionary of Archaeology. Frachetti MD. 2012. Multiregional emergence of mobile pastoralism and nonuniform institutional complexity across Eurasia. Current Anthropology 53(1):2. Frachetti MD. 2011. Migration Concepts in Central Eurasian Archaeology. Annual Review of Anthropology 40(1):195-212. Golden, PB. 2011. Central Asia in World History. Oxford University Press: Oxford. Hanks B. 2010. Archaeology of the Eurasian Steppes and Mongolia. Annual Review of Anthropology 39(1):469-486.